4 bufords, thanks for the comments. I'm really enjoying it. Rob, thanks for the lead. I'll check on that when I get around to finishing that part. 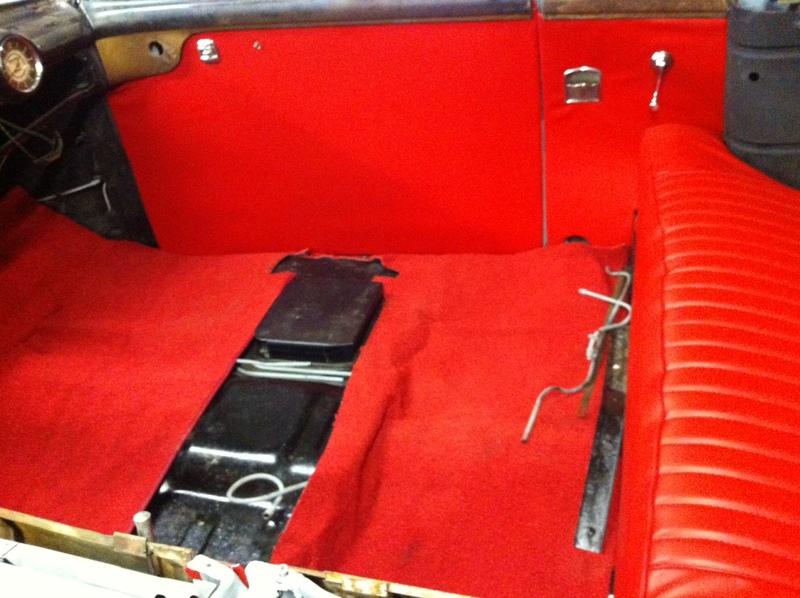 Next step is to cut and prepare the carpet for the bottom of the door panels. John, I really like this red and think it is going to contrast with the dark metallic blue that the body will be with a cord top. Next step is to find a "walking foot" sewing machine. I have to sew the design patterns into the panels that I just covered. I am finding that all of this is a great learning experience. I'm really enjoying putting the pieces together and learning how to "stuff a seat" and cut and cover all of the panels. I'm getting ready to pull the top out of the car. I've been talking with a gentleman who has blasting capabilities and powder coats. When it comes back, it will be ready for its final installation in the car, but the car has to be painted first. Pretty cost effective way of doing it. I am contemplating how to "re-chrome" or coat the irons that are chromed in the top assembly. I wonder if the spray chrome might be a good option since it will be out of the rain and sun? Scarlet red insides with dark blue metallic outside... very, very nice. What do you mean by "cord top"? I am impressed with the work you are doing in your car. The base panels is wood? The door panel material is a waterproof pressed cardboard. How's your car coming along? jackofalltrades70, is the material for door cards what most use? I had my interior done in 1997, and he did a super job with ULTRA LEATHER, 6-colors, but one of my door cards took on water from the inside, and buckled in a few areas. Today, I decided that I had better check fit on the door panels and then, while I was at it, I fit the carpet set also. Now that the carpet is cut and I am happy with the outcome of the fit, I need to sew new edges on where I cut this to size. I ordered the original set from Kanter for my car and it just didn't fit right. Seemed like it was an inch or so short on all sides. So, last year after I ordered this, Kanter made me another set, but left it long on all sides so I could trim to fit in my car. I was really happy with their customer service on that. I also cut the carpet piece out for the foot rest on the back of the drivers seat. Now I have to bear down and buy the sewing machine that I've been looking at so I can sew all of these details that really bother me and until I lay them to rest, they will be in the back of my mind, constantly bothering me. hehe. I still have to cut the carpet kick panels for the door panels and also sew vinyl along the edge of it. Only thing to report is.........I called on the sewing machine yesterday to set up a time to pay for and pick up and the gent told me that he sold it two days before. That's a showstopper right at the moment on the upholstery. I have some more small panels to do in the convertible well, but have been spending more time than I wanted looking for another machine that isn't going to cost more than my car did. These are very expensive machines and I thought I had that one. I was just trying to get the rest of the money together that he wanted. I started working on the arm rest/door pulls yesterday, but only got so far as I need to "SEW". Magnificent old Singer! I've never seen one with such a long reach. You're crushed I'm sure to have lost out on that one. Your interior is smashing! 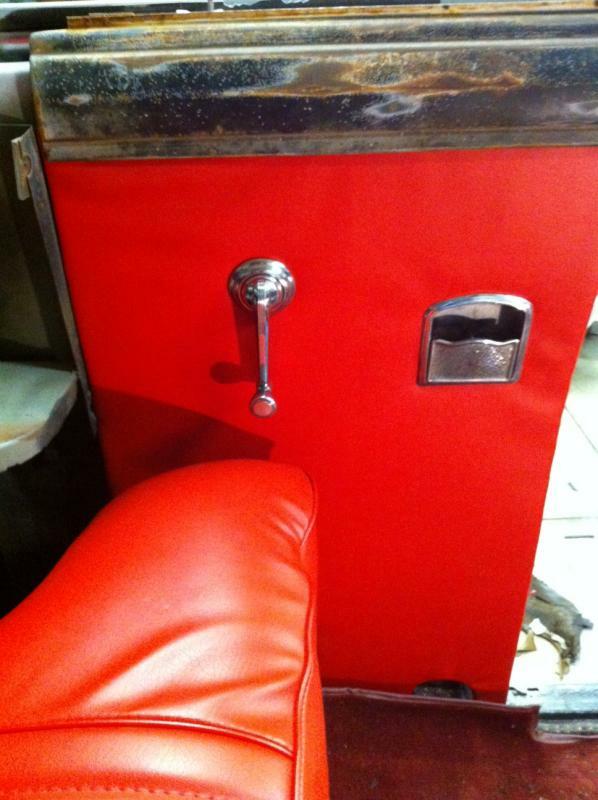 My new project has a red interior and you've convinced me to find the brightest, hottest red vinyl I can find. 1. Economical way to get the car back together and on the road. 2. I am not modifying anything that would hurt the car. 3. 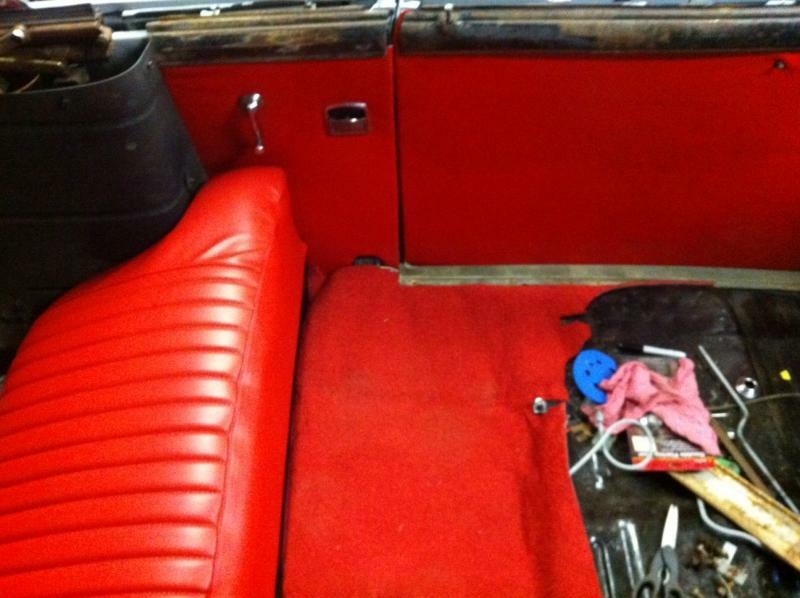 Easy to fix by ordering a new interior from one of the interior shops or do leather next time. 4. I get all of this valuable experience on how everything is done and I know my car in and out. Today, took the interior out of the car and safely stored it in the house where it won't get dirty and I can keep an eye on it. Started shuffling stuff around the garag and putting away stuff I won't be needing for awhile. Was a nice 54 degrees today so I aired out the garage and swept up and tossed out trash. Put some items I didn't need on ebay, etc. If the temps warm up a little more and stay there, might be able to finish up the bodywork. MATT, years ago, I took a couple of upholstery courses and have done some household projects. 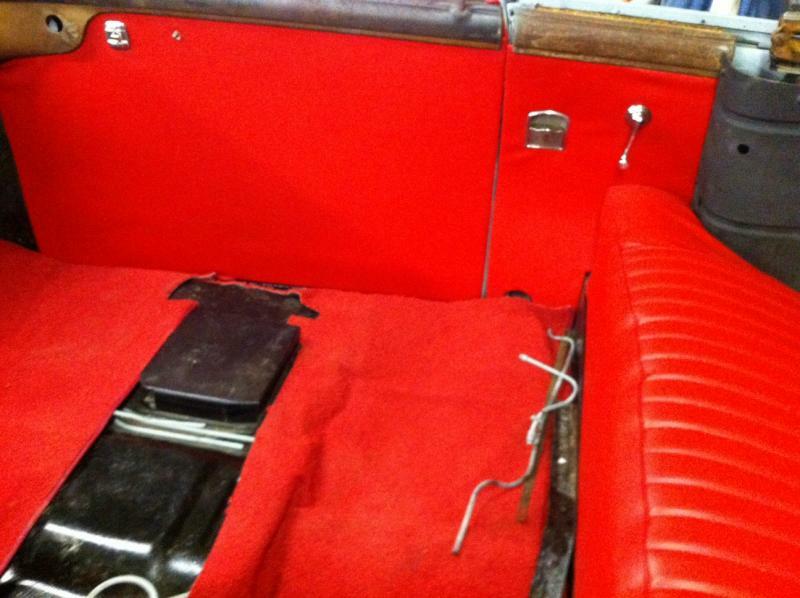 I don't want to tackle my Buick's interior because it has to be entirely redone. 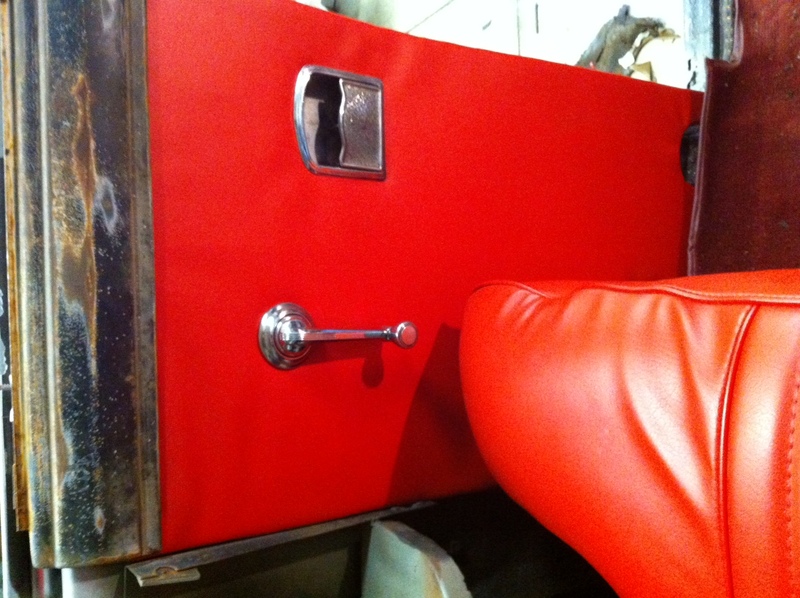 I'm so jealous of TG57Roadmaster's fabulous Lew Jenkins interior, which is the same colour and trim as mine. I don't want a puckered, baggy amateur job wasting all the lovely fabric I got from SMS. My Valiant, on the other hand, just needs the front bucket seats repaired. I can tackle that and do a complete makeover (in scarlet!) later on. One of my upholstery instructors told me that old Singer treadle machines are great for doing car upholstery. They're very strong and can handle multiple layers of vinyl or leather. You can go as slow as you want with them, instead of having an electric machine inadvertantly race on ahead, laying a seam where you don't want it. 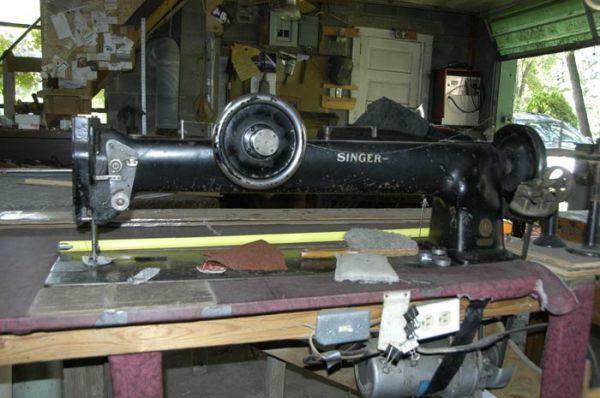 I spotted an old manual Singer at my wife's family cottage in BC a while back and begged it from my mother-in-law. it's in good shape - she used to make her kids' clothes on it - but I haven't played around with it yet. Wifey was out playing baseball when she should have been home learning how to sew, so she has no clue how to run this machine. I recently downloaded a scan of an old Singer operating manual. This is low-tech, I can figure it out. Rob, interesting about the treadle Singer's, as my wife got one from her aunt, shortly before she passed away. Perhaps I should clean it up and try it out? Well guys, still looking for another sewing machine. 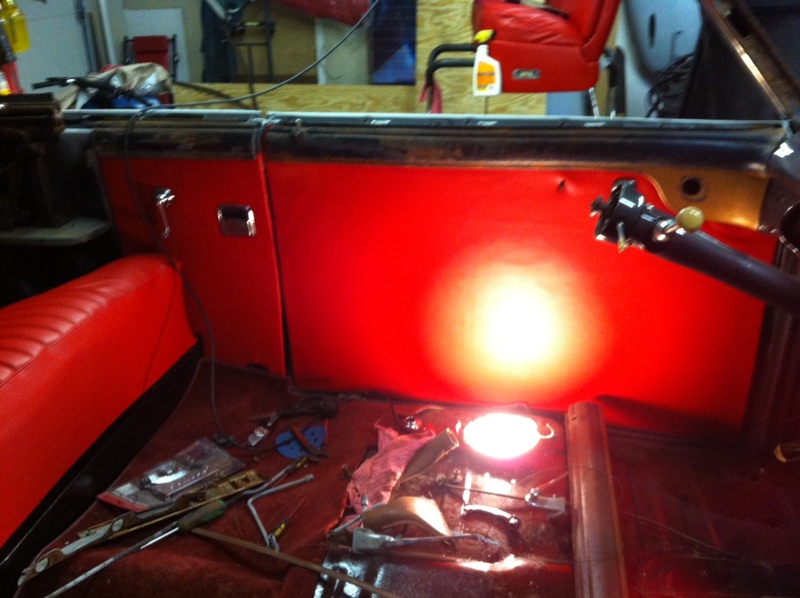 In the meanwhile, I've been working over some more stainless steel trim and taking off the final pieces that need to be taken off to finish the rest of the panel beating and finalizing prep for paint. I've been hunting down a battery tray for a Roadmaster and haven't found one that won't break the bank. Exterior door handles are now off the car and in the "to be chromed" pile of parts. I have a few bits and pieces to take off of the convertible top section and that should be everything for "the plater". New to this forum. I have a '47 56C and 56S so your thread has been VERY interesting for me. I would like to send you a PM in regards to parts. How would I do that? Lol, I know what you mean Matt. My shop area is actually at my Mom and Dad's house. I live right behind them. Much to my Mom's dismay I have temporarily taken over their third bedroom(which they just use for storage anyway)for car parts and chemical/paint storage. She wasn't too happy about it and I am under the restriction that the parts must be clean. I'm putting all of my clean, painted parts in there for now. 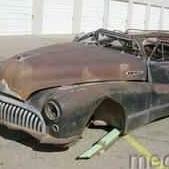 I also have a few large parts in there(bumper, grill, fenders, etc.). 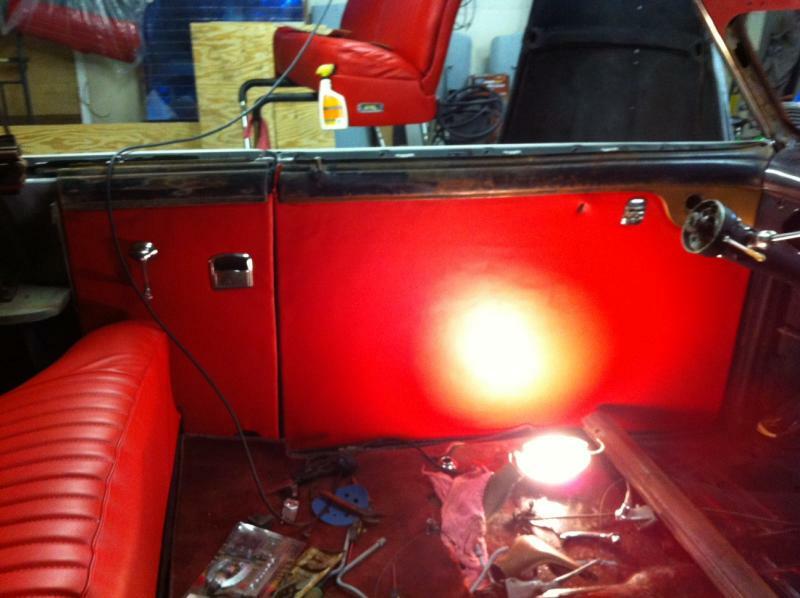 When I began taking apart the front end of the car I quickly outgrew my shop area. I can't imagine what it would be like if I had the entire car apart at once! You could always build UP instead of OUT. Add a second story to that garage! My main space is an oversized single garage, which is heated and insulated, as here you can't work in winter without it, but its' tough try to keep the parts organized. I take over a large porch like space at the back of our house for parts storage, plus I have a basement workshop, but not too much space there for storing large and or numerous parts. Got the package today! Thanks a bunch. The little problem with the clip with be remedied via the miracle of Tig welding. The cover plate is way better than the driver's side I have. I'm close to have all of the little hard to find bits.